Can there be a more 1970s fabric than orange polyester suede? I found some on a trip to Goldhawk Road a couple of years ago and something possessed me to buy a couple of metres. Whatever plans I had for it then didn’t come to fruition and it’s been sitting in my stash ever since. The day finally came when the stash overflowed and the suede had to be matched with a pattern or else given away. But what pattern to choose? I was vaguely inspired by the lines of the Louis Vuitton Fall 2014 collection: dresses with big pointy collars, front zip closures, and a-line skirts. Look 23 from the collection is a good example of the sort of thing. 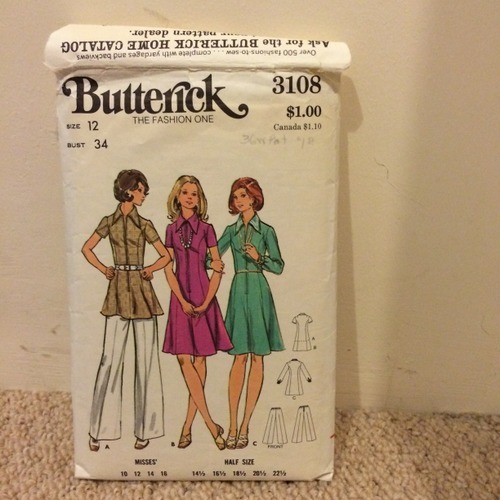 Unsurprisingly the most suitable pattern I could find with those features was a vintage one: Butterick 3108. Pattern envelope pictures sometimes lie, but this one is a pretty accurate representation of the finished dress. The collar is just as large and pointy as I was hoping for. The skirt is nowhere near as short as the Louis Vuitton dresses, but as I’m hoping to wear this to cycle in that’s not a bad thing. I added top-stitching on the princess seams for a bit of interest. I also made patch pockets. I’m not entirely happy with those. They have come out too close to the centre front despite my best efforts to choose a pleasing position. Luckily I was able to get a copy of the pattern in my size so I didn’t have to make a lot of adjustments to the beyond adding length. The main change I made was to redraw the top of the sleeve pattern piece to remove all the sleeve cap ease. I didn’t fancy my chances of setting in the original sleeve without wrinkles as the suede has no elasticity at all. I’m pleased with the fit on the body, but the sleeves are very restrictive. Whatever I did to the sleeve caps obviously wasn’t quite right! And now I look at the pictures it could do with a touch more width at the back hip. I made a couple of other small changes to accommodate the unforgiving fabric. I pleated the sleeves into the cuffs instead of gathering them. And the hem is faced rather than turned up. 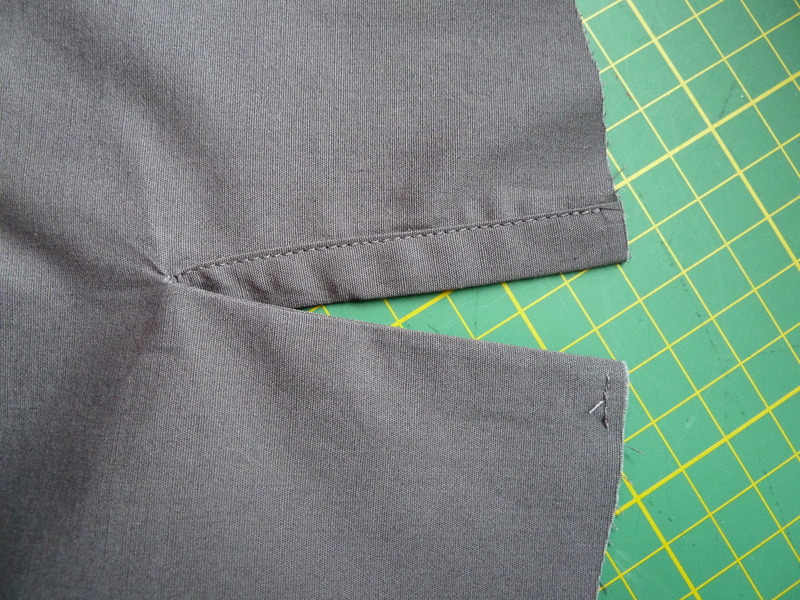 The hem allowance on the original pattern is two inches and isn’t tapered at all so there would be a lot of extra length to ease in if you tried to turn it up. I doubt that would work well even in cotton or wool fabric, never mind unshrinkable polyester. The zip is brown because the orange is impossible to match and brown continues the 70s theme. The neck and hem facings are finished with some brown satin bias binding I had left over from another project. Unfortunately I didn’t change thread from orange to brown when sewing the zip in and the orange stitching shows up a bit against the brown zip tape, but I did remember for the binding. Not that you can see the stitching in the pictures anyway so I doubt anyone will notice. I’ve made the fabric sound awful but it does have some good points: it’s easy to sew, it’s machine washable, and it’s very warm to wear. I’ll be glad of the insulation when autumn arrives. 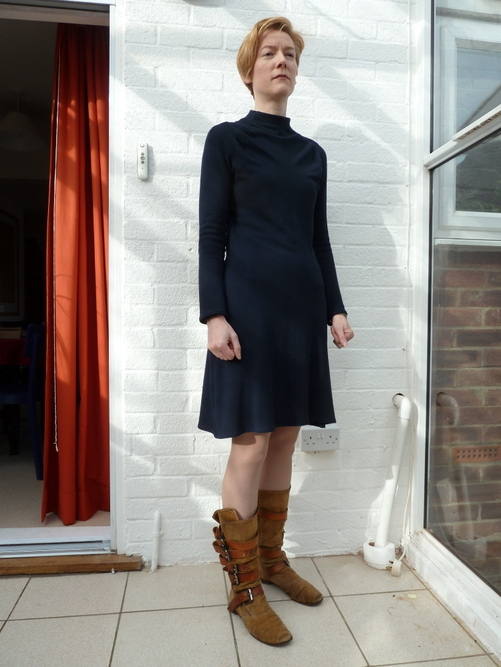 This dress fulfils two purposes: it should work for cycling and it uses up some stash fabric. I was getting bored of wearing jeans every other day, but I have very few dresses that are warm enough for winter and can be worn on a bike. This has long sleeves and a high neck so should keep the chill out. 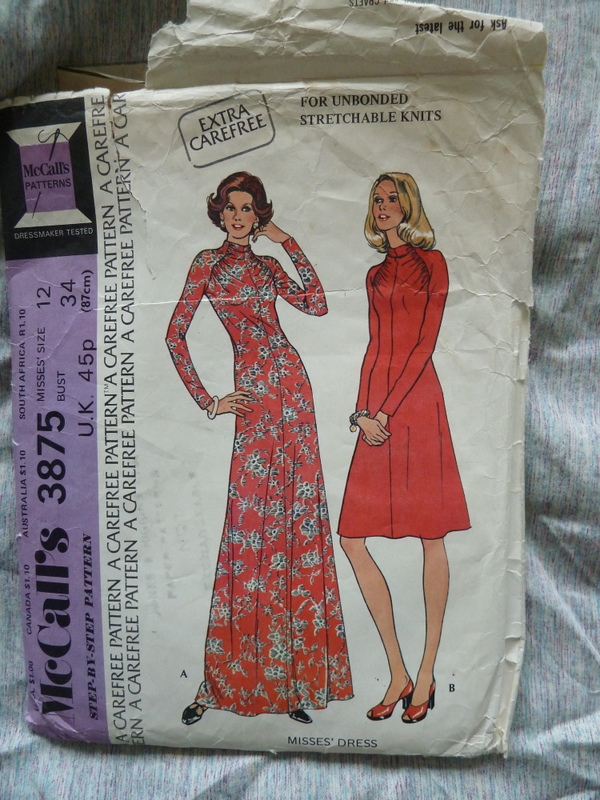 The pattern is vintage, McCalls 3875 from 1973. I’ve had it a while – so long that I can’t remember where it came from although it was probably an Etsy shop. I love these 70s illustrated pattern envelopes. There’s something about the lovely clean lines and bright colours of the pictures that appeals to me; much more so than ones with photographs or more painterly illustrations. This is a very simple style and extremely quick to sew. The only detail is that the bust shaping has been turned into gathers at the raglan sleeve seams. Not sure mine’s come out looking as gathered as the illustration. Here’s a closer look. I was a bit dubious about the gathering originally – especially on the envelope’s maxi dress view where it’s paired with a ghastly floral print fabric – but now I have made the dress I very much like the effect. I think it needs a solid colour though, and probably a fairly neutral one. I’ve gone for navy blue because that’s what I had in stash of the right weight and hand. 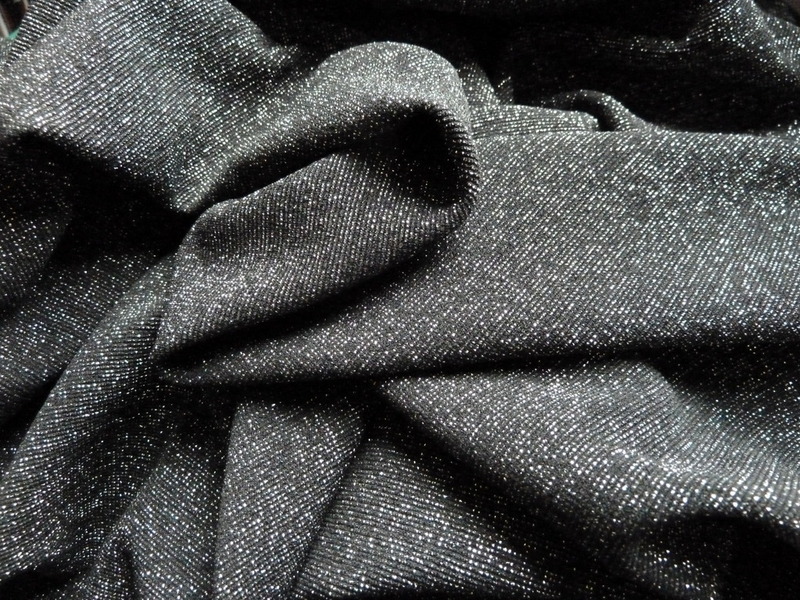 The fabric is a very drapey viscose doubleknit which was described as ‘crepe jersey’. It certainly has that matte, slightly textured, look of crepe on the right side. It came from Minerva Crafts. I added side seam pockets to the dress. These have not been entirely successful. The jersey is not sufficiently stable to support them so they tend to gape. I took quite a few precautions: interfacing along the side seam lines, cutting the front pocket bag out of lining fabric to reduce bulk, and eventually adding clear elastic to the side seam, but they aren’t great. It doesn’t help that I put them in too low and had to rip them out again and reposition. The jersey hates being unpicked at the best of times and I’d already overlocked things, so this made a big mess and I lost a bit of seam allowance here and there which I think has contributed to the gaping. The other alteration I did was to make a facing to finish the neck. The original pattern has an extra-wide allowance that you turn over and tack down, but I was worried it might be too floppy. My facing is interfaced with some light weight fusible. It turned out that this was a good thing; when I measured the pattern to check the length of the facing pieces I realised that the neckline is much wider than the pattern illustration shows. I took all the seams around the neck other than the CB seam in by 1cm (ie sewed them 0.5cm deeper) to get the neck to look the way it does. The back view is intensely plain. I’m proud of my invisible zip though. The hem is a bit limp; I probably should have interfaced it. And as always with 70s patterns I had to hack off quite a few inches to get the hem to the length I’d intended. The original pattern came to well below the knee. It didn’t look bad at that length but this is better. I think I’d make this again if I could work out what to do about the pockets. It’s possible they’d work better if I’d placed them correctly first time, or at least not damaged the fabric when moving them. The style needs a drapey and stretchy fabric so I can’t see welt pockets or patch pockets working any better than side seam pockets. And not having pockets isn’t an option. If anyone has any bright ideas, do let me know. I like the dress despite the flaw though. It seems like a long time since I made this dress. I normally photograph new makes right away, but this one’s been sitting around for a few weeks while I’ve been unwell. Things are getting better now so I have slapped some makeup on and got photos of it at last. 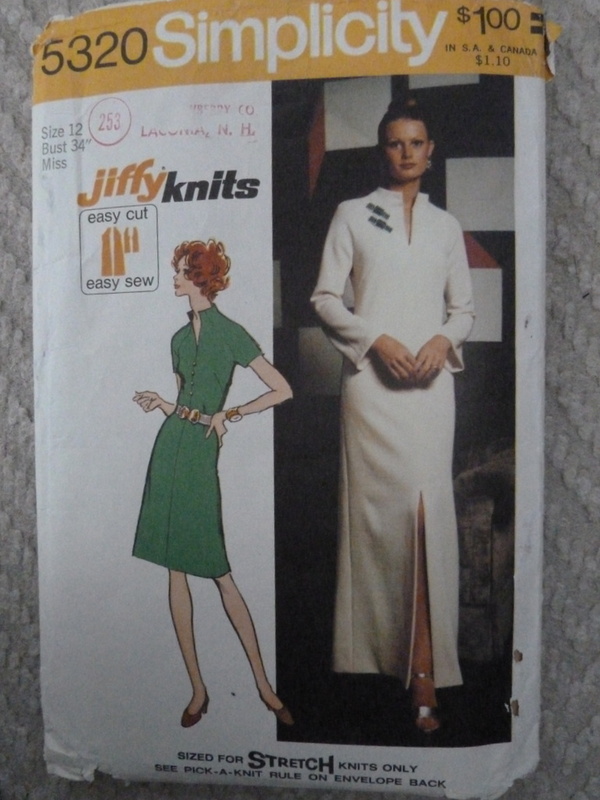 The pattern is Simplicity 5320, a 1972 ‘jiffy’ design. I was drawn to the raglan sleeves and high collar. The fabric’s boiled wool jersey from Truro Fabrics in a shade called foxglove. 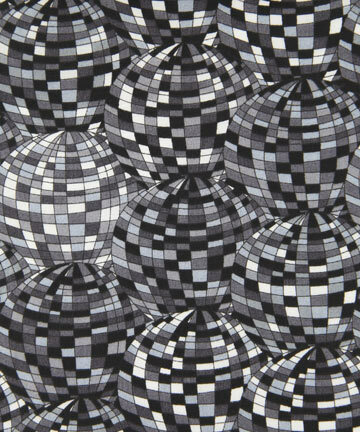 Right now the fabric is still available here. This whole project was a bit of an experiment in colour and shape. I normally choose styles with a defined waist, which this certainly hasn’t got, and I was also dubious about the flared sleeves. Where would I store the pile of tissues that I normally keep tucked into my sleeves? Finally there was the colour. I never wear pink. I bought this fabric on whim after looking at colour analysis websites; those ones that try to divide people into twelve or sixteen categories based on seasons and assign a palette of flattering colours to each. I still don’t know what my season is but it made me think I might be able to wear some colours I’d previously avoided. I got round the sleeve problem by adding inseam pockets. The pink fabric is very thick so I made the pocket bags in black polycotton, which means they show a little more than I’d like. I think the pink works, although it helps that my dye job has faded from its usual shade of red. The collar is great but it needs a lot of interfacing to keep its shape, which wasn’t mentioned in the instructions. And I had to take five inches off the length of the skirt. The short view was below the knee on me and I’m very tall. Here’s the back. There’s an invisible zip which probably isn’t needed. My fabric doesn’t have a lot of stretch so I didn’t want to risk skipping it. I’ve been surprised to find myself reaching for this dress a lot since I made it. It’s very comfortable to wear but slightly smarter than jeans. It’s an easy make too, especially if you don’t put in the zip. Definitely recommended. Saturday was such a great day. Marie and Kat organised a sewing blogger meetup in Birmingham. Check out Marie’s blog post for pictures. We shopped, ate noodles, swapped a ton pf patterns and fabric, and then shopped some more. But absolutely the best bit was talking to like-minded sewists all day about fabric, sewing, and patterns. So what did we buy? Quite a few of us bought some of this sparkly heavyweight knit from the Rag Market. When I saw Kat’s I had to get some of my own. I’m seeing this as a cowl-necked, long-sleeved knit dress worn with a big belt. This one came from the Rag Market too. It’s a really bright blue with a hint of purple. My camera insists on rendering it as a sort of sky blue. I tried reading the camera manual, but no amount of fiddling with white balance and lighting was effective so what you see here is courtesy of the GIMP. 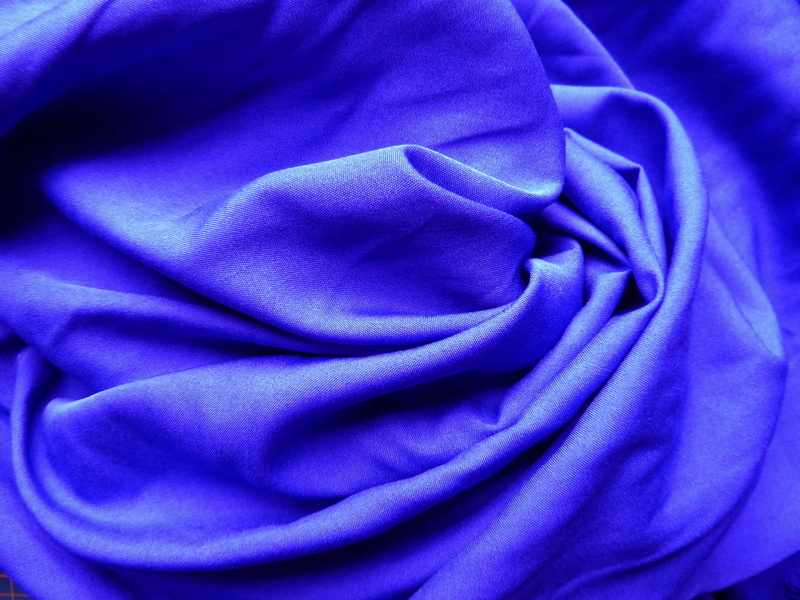 The fabric itself is a lightweight, silky texture and very narrow. I think it would work well as something like one of these two patterns. The 80s one is one of the ones I got from Katie in the swap! 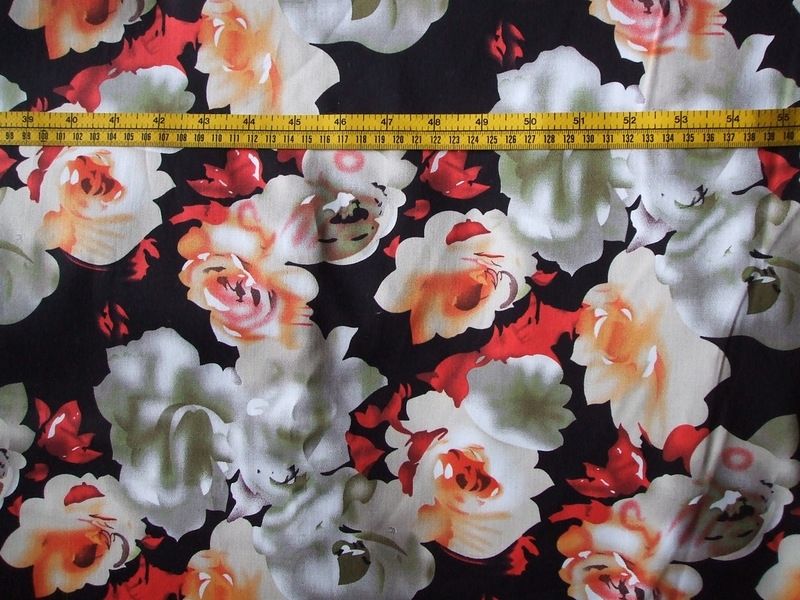 And coincidentally it has a layout and yardage for 90cm fabric. Were fabrics narrower in the 80s or something? 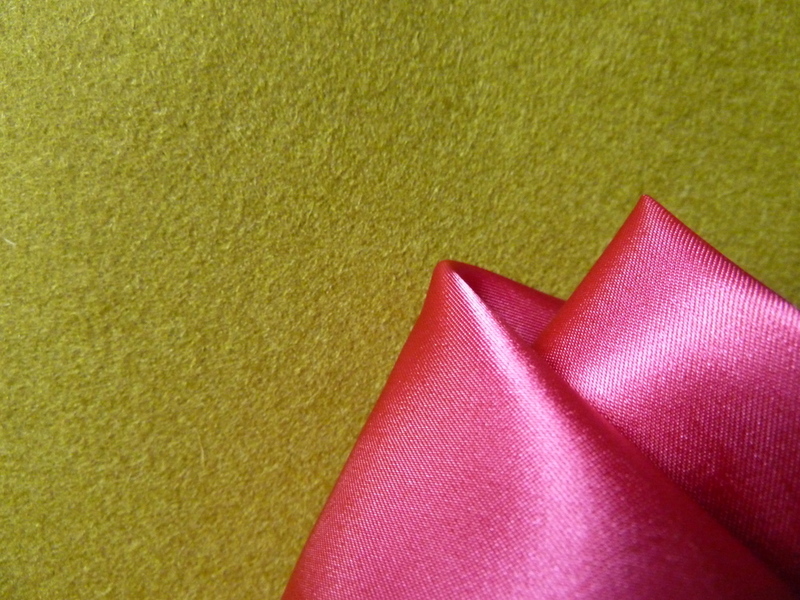 I got bright pink lining for my chartreuse coat. Claire and Alice spotted it in the Fancy Silk Store. Here are the two fabrics together. Yummy. Thanks again Marie and Kat and everyone else who came along! After I made my Death Star shirt dress I found I couldn’t stop at one. They’re so practical for work. 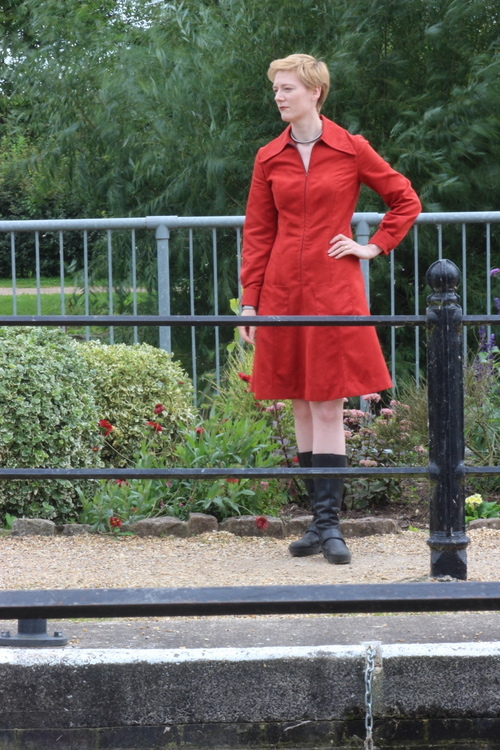 This time I used a vintage pattern, Simplicity 6270. I made the view in stripes on the envelope: long sleeves, shirt collar, and worn with a leather belt rather than a self-fabric one. I swear I didn’t plan to make it in the same grey as the left hand picture on the envelope. 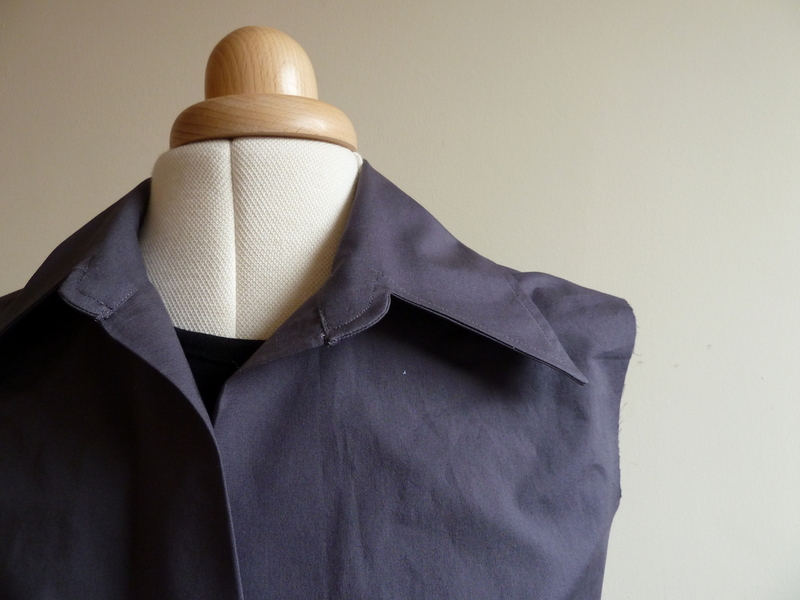 But I had some grey stretch cotton poplin that was perfect for a shirtdress and I’m trying to reduce the stash a bit. So here it is. 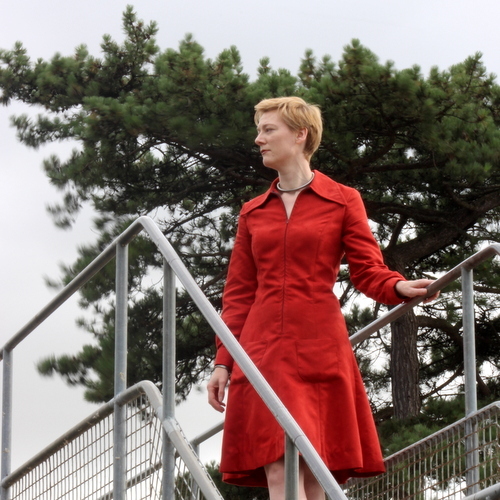 Unlike the Burda pattern I used for the previous dress this one has proper cuffs! They were quite a faff to make but worth it. Binding the slashes in the sleeves was less fiddly than I expected. I really like the 70s collar but if I was making this again I think I’d make a two piece collar. The one in the pattern has the collar stand as part of the main collar piece and it took a lot of pressing to make it sit right. This photo was taken just after I attached the collar; the buttonholes haven’t been made yet. Here’s the back view. I shortened the skirt by a good three inches. 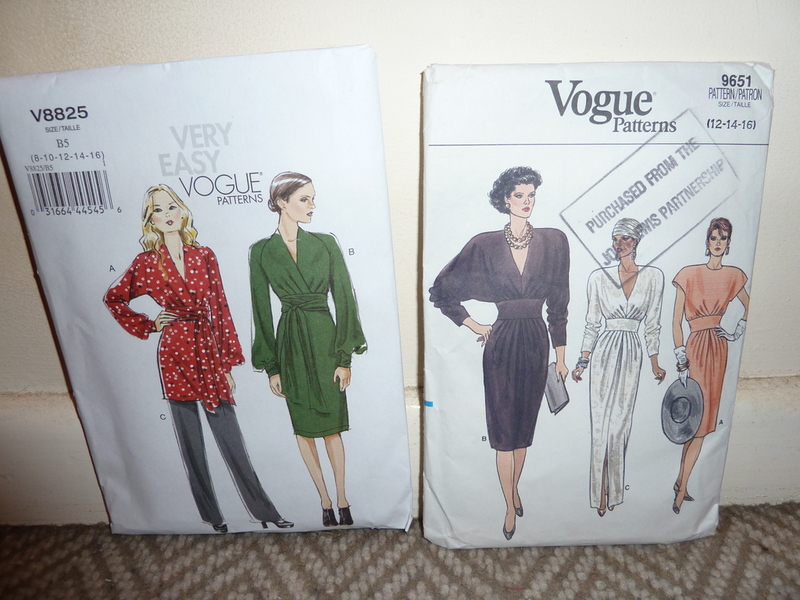 Vintage patterns have such low hemlines and they look terrible on me! You can just about see one of the side seam pockets in this photo. They weren’t in the original pattern, but I’m trying to make the effort to add pockets to patterns where I can. I’m always glad I’ve done it after the event, even though it seems like a lot of extra work at the time. So there it is. 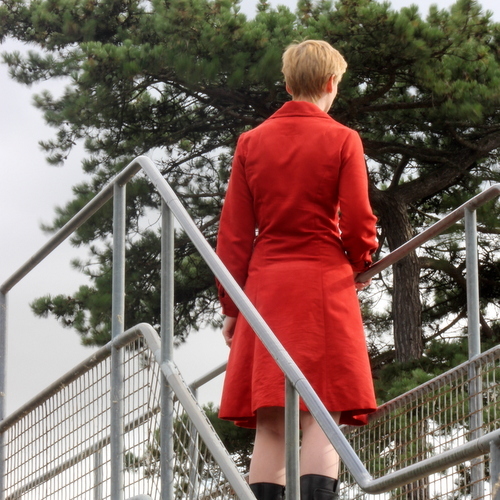 Next up will be the coat project I hope! I finally finished my wrap dress. It is a copy of a Vivienne Westwood dress I had for many years and wore until it wasn’t fit to be seen. The style is no longer available so the only solution was to make my own version. It has a lovely asymmetric collar detail. The left collar extends into a flap which tucks though a buttonhole on the right collar. If you wear it tucked, as below, you get a keyhole effect. But it also works well worn open. Here are some side views. Hopefully you can just about see that the front hem corners are curved and that there’s a wide line of top-stitching around the edges holding the facings firmly in place. Installing the facings was a bit of a nervous moment as they go the whole way round the dress, including the hem and the neckline. You sew the facings together in a loop and hope you were accurate with seam allowances and it’ll actually be the right length to fit onto the dress. I was very relieved when mine went on smoothly. The back of the dress is fairly plain by comparison. If anyone’s wondering about the post title, the Liberty print this dress is made from resembles the Death Star when viewed close up. Despite the science fiction inspiration, I think the final effect is more vintage than modern. I’m no fashion historian but it it feels a bit 1930s to me. The sort of thing you might wear to take tea with the vicar in Agatha Christie or PG Wodehouse. Not the kind of event I regularly have to dress for! But this will get plenty of wear for fixing computers and teaching maths. Here’s the final incarnation of the alien flowers fabric. This is a vintage Simplicity pattern, number 5349. I’ve made it before in a black and white print and was surprised by how much wear it gets. Despite looking a bit dressy it’s really comfortable, so I find myself reaching for it on any reasonably warm day. Although not with these shoes! A pair of Converse are more likely in real life. The dress is backless so you do need a hoodie or a cardigan over the top most of the time too. I tweaked the fit a bit on this version, but the main change from the original was that I faced the hem so that it’s nice and heavy and hangs really well. I underlined the fabric too. It all needs to be quite close fitting and structured to hold everything in place without a bra! The fashion fabric has a bit of elastane which helps there. But my next project is definitely going to be a solid! It’s not as if I don’t already have several projects lined up. But I saw this in John Lewis and fell in love with it. The label describes it simply as ‘floral’ but this does not do justice to it. Floral to me means sweet and girly. I think there’s something slightly alien and spooky about these flowers. They look like the sort of thing that might move when there isn’t any breeze. 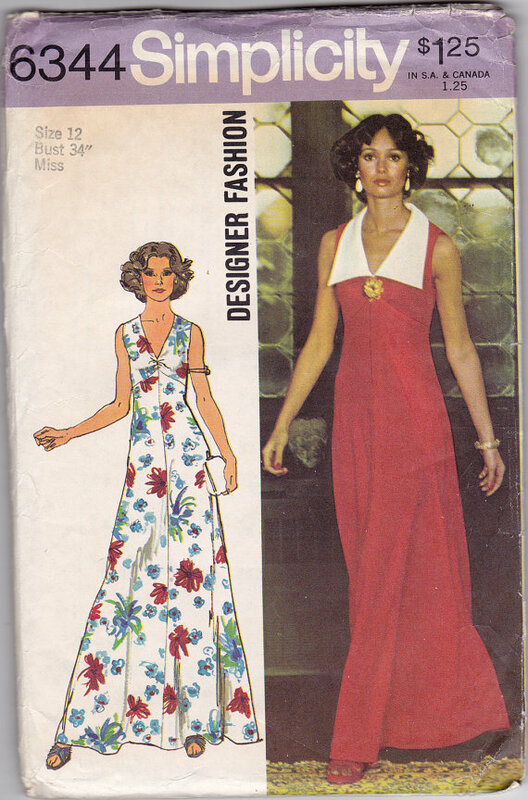 It’s going to be a 1970s halter neck maxi dress. I already have the pattern, a vintage Simplicity that I’ve made up before. I’ve still not done any sewing. But I have acquired some new patterns, despite already having about four projects lined up. 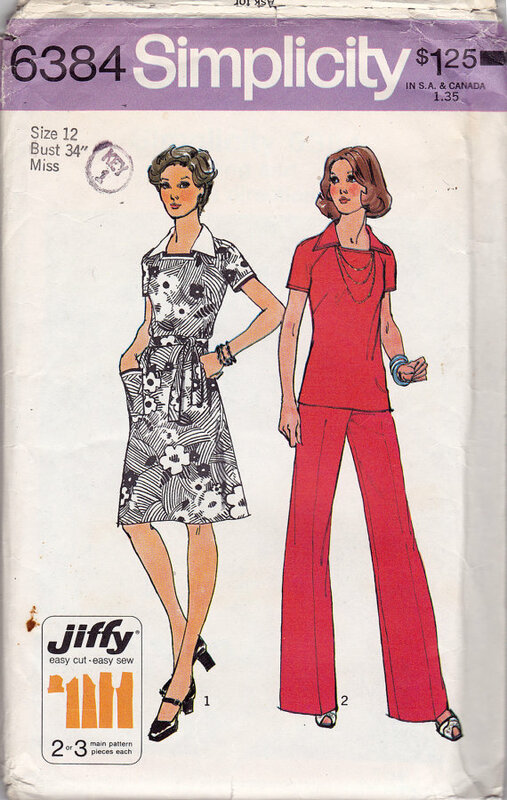 It seems I can’t resist 1970s Simplicity patterns. It’s something about the envelope art. First up is a maxi dress. I never used to like these, but since I made one last year I am in love with them. I think the reason I never used to like them is that I am pretty tall, so hems on RTW maxis would hit me well above the ankle. If I make my own they can be as long as I like, although I found out the hard way that floor-sweeping hems are not the best thing for going up and down stairs in! I really like the big collar option on this one, and unlike my first one it’s not backless so I could wear it for work. I’m not sure what colours to make it in though. The white collar on the envelope looks good, but I wonder if it would work if I made the whole dress, including the collar, in a bright solid. The next one also has a contrast collar. I bought this for the dress rather than the tunic and trousers. I’m not keen on the print on the envelope picture but I know there’s a really great dress hiding in there somewhere. Again I am not sure about what colours to use. Both this one and the one above are from ZipZapKap. 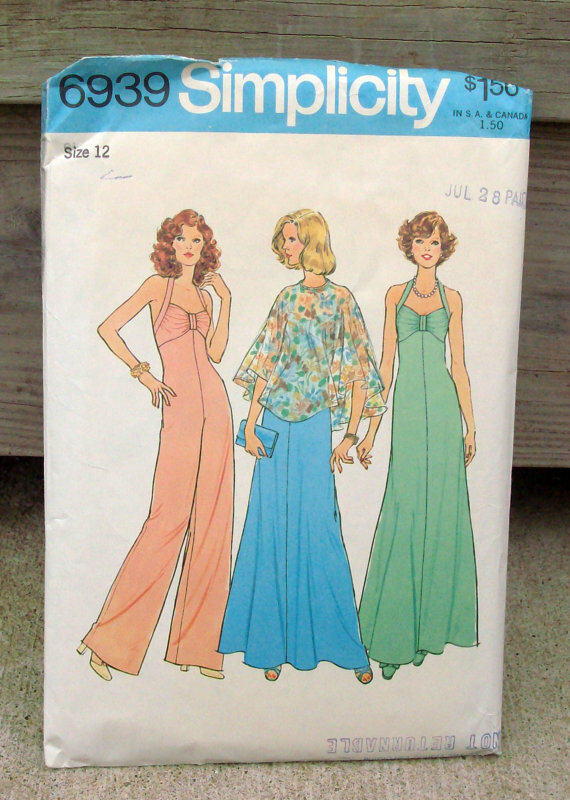 Finally, I found this jumpsuit pattern that I’ve wanted for a while, and in my size too! 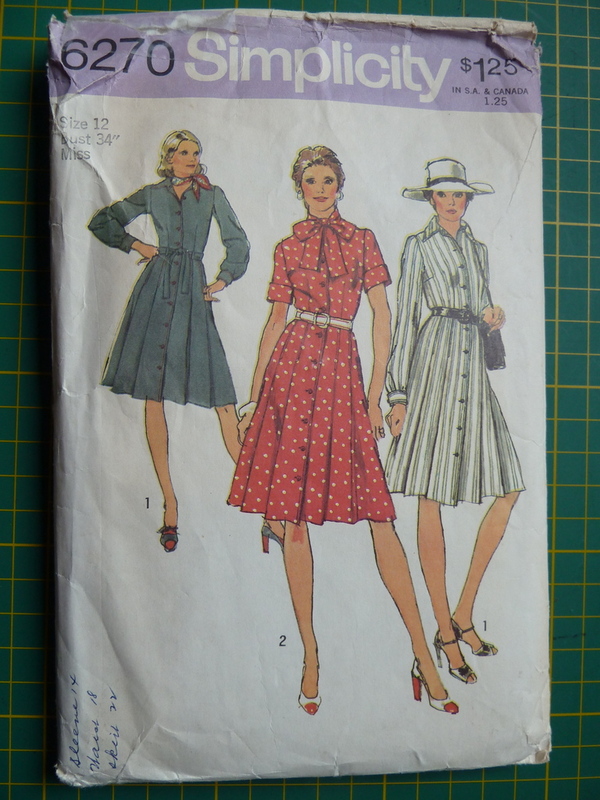 I might also make the dress, although I have to say I don’t go a bundle on the poncho (although yes, I am the same woman who made the space curtains top). I’m seeing this one in bright orange rather than the coral shade on the envelope. This pattern was from LovelyLove Patterns. So many patterns, so little time!